My wife and I have had the pleasure, agony, elation, disappointment, amazement, and disbelief in what we have experienced in the hundreds of meets we have competed in, directed, worked at, and observed. In brief, I can safely state that from the positive to negative, we have seen it all. My perspective goes back before the organization of powerlifting as an official Amateur Athletic Union sport. In the early 1960s it was no more than a group of guys that decided to get together on a Saturday morning at a storefront gym or the local YMCA and take on those from another group of trainees in a specific list of lifts that everyone agreed to attempt. The so-called Odd Lift Contests would include the bench press and squat in that order, with another one, two, or three lifts to follow. Dependent upon those involved, their strengths, weaknesses, and preferences for certain lifts or exercises, the other competed lifts might include the deadlift, strict or cheat curl, and/or upright row. The form for all and any of the lifts could vary from exceptionally strict to rather half-assed and loose, again dependent upon what the organizers agreed to. Some family members, non-training friends, and others from the Y, garage, basement, or storefront gyms in the area might serve as spectators with audience members frequently requested to “come on up here” to serve as judges, loaders, and spotters. A lot of weight was lifted and I recall that despite some very heated rivalries among participants and the very few “real” gyms in the area, fun and camaraderie ruled the day. There has been a lot of revisionist history in the sport of powerlifting, with some who control historical materials rewriting the importance of their own place within that history or forgetting that like most human endeavor, there were a lot of bumps in the road. As a new sport that was viewed as a definite threat to the established power and popularity of Olympic Weightlifting, the autonomy of powerlifting caused hard feelings and a bit of anger in some quarters. It took further growth and the passing of a few more years after the 1964 establishment of powerlifting as a “real sport” before it was in fact granted autonomy from Olympic lifting and those who controlled the weightlifting activities in the United States. Yet at powerlifting contests which attracted little attention past the involvement of the competitors, their friends and family members, the actual competition was almost always marked by displays of good sportsmanship and support for every lifter’s efforts. One of the oft-repeated comments I have made is that every lifter at every contest I was involved with received the vocal and emotional support of every other lifter on the platform with them or observing from the audience. Everyone understood the importance of a 135 pound or 60 kilo squat that marked a young lifter’s second contest attempt because we had all been there at some point in our progress, facing off with what was at the time, a big lift and major challenge. Everyone cheered and no one had the attitude that “This guy isn’t lifting very much” because it was understood that for that specific lifter, that specific weight was in fact an important obstacle that was to be overcome. 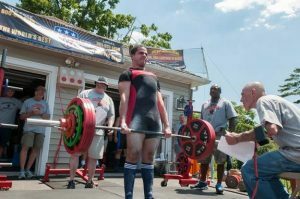 Nico Louizos entered last year’s Titex-East Rockaway Classic as his first meet and this was his second! Perhaps “historical” is a misnomer but our driveway contests hark back not only to the odd lift contests of the early 1960s, but to the “gym challenges” I was also involved in as a member of the late and exceptionally influential Tony Pandolfo’s group of trainees at his small storefront gym. There is always a “lifting guy” in every neighborhood who obviously trains with weights for one reason or another and Tony was that guy. His Mr. America class winner physique was a true selling point for weight training long before it was acceptable or fashionable and he influenced run of the mill guys like me and big time contest winners like Dennis Tinerino with his passion and enthusiasm. On a number of occasions, Tony would say, “If you’re not working on Saturday, some guys from (and he would name another of the very few hole-in-the-wall gyms or group of guys who trained in a basement together) are coming over to have a deadlift and curl contest. We need you to get some points for the team.” These types of planned or impromptu contests and the “more organized” Odd Lift meets at one of the Manhattan or Brooklyn YMCAs had a profound influence on my growing affection for strength training, very much augmenting the actual physical and emotional benefits I received. 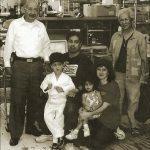 Being involved in the planning, organization, promotion, and actual completion of state and world championships was rewarding but I always came back to the enjoyment that came with the smaller, local type of endeavor. Linda Jo Belsito and what might have been four or five other national or international level female lifters were joined by one of our male middle aged trainees who wanted to try a contest for our first “driveway meet” in the mid-1980s. Sanctioned, adjudicated by international card holders, and providing the best equipment of the era, we had a wonderful and successful time and the driveway filled up with neighbors and strangers passing by who saw the activities. That we had the grill going and everyone showed up with a homemade dish that would feed three or four others, made the entire day a huge success. The two driveway meets we have had at our East Rockaway home have featured a number of unusual things, especially for a nine-lifter contest: a fantastic and original arrangement of the Star Spangled Banner by the TRI-CEPS, three of our professional jazz musicians who prepared and played a specially composed saxophone version of our wonderful anthem; official meet tee shirts, and awards for all including Best Lifter trophy (thanks to Siegel Engraving). I had Beast Metals of Sacramento, California fashion our custom hammer type awards for the second year. We gave away 274 burgers and 280 hot dogs in addition to Starbucks of Rockville Centre’s contribution of the presence of their baristas and store manager and gallons of iced coffee. With multiple ER Racks, Titex barbells and plates in the warm-up room and the support of our very experienced and capable spotters and loaders, we obviously had the capability of running an all-day long meet for sixty or more lifters. However, noting the zeal and unbridled support that comes from lifting in front of family and friends, our very small, intimate gathering for Kathy and me, was much more rewarding. There is a place for big-time, major powerlifting contests. I never thought that giving prize money was a good idea and the so-called professional powerlifting contests did not make significant inroads. I still don’t have a great deal of comfort with the “mega-meets” that run 100-150 lifters per day on three or four platforms operating simultaneously. I understand and accept the place that these types of meets occupy within the structure of the sport, giving many lifters and especially inexperienced lifters an opportunity to compete. This also allows the specific sanctioning organization a chance to enhance their membership rolls which remains the lifeblood of the sport in the U.S. As importantly the huge contests allow the meet directors what might be their only opportunity to make a profit. Meet directors are allowed to make a profit for their time and effort, and let’s be very frank; if every meet was a money-losing proposition, there would be an immediate vacuum created with an absence of contests and the loss of both the sport and its supporting industries. There is nothing negative about meet directors making money while providing a service and for many if not most, hosting a very high volume of lifters is the only way to accomplish this. I am just one individual who does not enjoy those types of contests, even when they are exceptionally well run. Very much like the college athlete who enjoyed the more personalized experience of high school sports, many, and I am one of them, cherish the small, underpublicized contests lacking hype and exposure that still brings together lifters that primarily hail from the local area. Any rivalry that exists between gyms or among lifters is usually heightened in a positive manner, pushing one to greater effort in front of friends and family. It is much more difficult to “sell” the importance of each lift or at least multiple lifts, with two or three platforms running simultaneously, even with skilled and entertaining announcers like Gino Biancheri on the microphone. Of course, I had my reminder of all of the above this past weekend while directing, announcing, coaching, expediting, and judging at our purposely “over-titled” 2nd Annual TITEX-EAST ROCKAWAY POWERLIFTING CLASSIC. Our contest was so much fun and so motivating and positive for the six young, inexperienced lifters involved in the 2015 edition, that Kathy and I did it again. We hosted nine lifters this time and in addition to the four brand new to competition, four were in their second meet, with last year’s contest their first and only. Will Martorana, a high school junior-to-be, was “the old hand” since he had last year’s meet and a fourth place showing in the USAPL Massachusetts State High School Championship to his credit. Each novice lifter had family, friends, and the support of our extended lifting family and patient group behind each attempt. As we did last year, there was some ironic observation that Linda Jo Belsito, Frank Savino, my wife Kathy, and me as coaches, have mentored so many world and national champions in powerlifting and strongman events as well as a large barn-full of professional and Olympic athletes. As we would with World Champions, as coaches we gave our best and agreed that coaxing top performances out of the young and new-to-the-sport held the same enjoyment if not more, than watching World Champions and/or NFL players compete under our tutelage. This of course is the advantage of providing smaller or just plain “small” meets; it allows local lifters and their families the opportunity to be involved without traveling, spending money for food and lodging, and meeting with other relatives and friends to cheer on their own and the other lifters they have probably met at one time or another. It is much easier to foster a sense of head-to-head competition, even at a relatively low level of development when everyone’s attention is focused on lifters that are known to the audience and have emotional ties to them. Needless to add, the sense of kinship is high when most of the lifters are acquainted although as a general rule, I will return to my earlier statements that at most contests across six decades of involvement with powerlifting, there is an atmosphere of support and good will. Big meets, small meets, three platform contests, and those held at large indoor arenas, hotel ballrooms, or convention centers all have their place in the sport of powerlifting. No matter what one’s preference is, my hope is that everyone involved does their part in making every contest experience enjoyable. History of Powerlifting, Weightlifting and Strength Training – Number 91: Black Market Business Константин Павлов чемпион из России.